Free days are really...what? ... nice?! When I started my lazy morning with an uncommon breakfast at around 11 o' clock, the team was already since hours in the snow keeping dogs and tourists in line. It was a busy day with rare guests. Since I'm living in the Safari house I see the tourists coming for putting a needle on our guest-map and leaving with bags full of souvenirs. Most liked are the plush Huskies, magnets and sundry odds and ends, but you can get their some really nice things, too. I always like to have a look on the colorful offers. You can find their colorful handmade socks and scarfs, reindeer hides and adornment made of reindeer horn, handmade ceramics. Today I had the pleasure to listen to a Spanish guide who explained a story about a traditional Sami headgear. He told that the 4 edges of the hat represent the 4 winds: the Northern, the Southern, the Eastern and the Western wind. 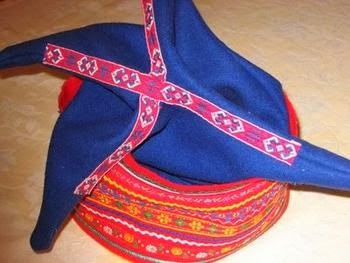 The Four Winds hat is called čiehgahpir and part of the traditional Sami costume. It is framed with traditional very colorful patterns. The ones you can buy in the shop are additionally decorated with 4 streaks in blue, green, yellow and red, the colors of the Sami flag. I learned that Rovaniemi is the capital of the Sami society although the biggest Sami community in Finland is living in Oulu. Sooner or later every tourist find his way to the Safari house. We had also an Estonian group today. Since I left I haven't spoken Estonian at all. I enjoyed to hear the language and tried to remember a few words. It could have worked somehow if the friendly, elder guest wouldn't have tried continuously to answer in Finnish. So we talked happily at cross for a few minutes, both in a language we had just rudimentary knowledge of and laughed together about our failing. I have still no idea what he was trying to tell me. The 13th of February was a painful day for our Miss Sunshine. She was bothered by a uncomfortable headache. It must have been really terrible, because after the feeding she just fall asleep on wooden, really hard bench in the guide room- much to the delight of us trainees. It was stressy for most of us. I had to work with 6 sledges-freeing them of their harnesses by my own. I had to hurry, the next group was about to arrive. Actually it should be no big deal to do that on my own, but I was tired and daydreaming a bit. Trying to move one team a bit forward, as I have done at least 50 times in this month without problems, I lost the team and rolled into a snowbank. I was suddenly awake. I was working the whole time alone, but obviously in that moment I had a really amused public. He got my sledge and laughed with me. But it was not the last time I ended up in the snow that day...Just an hour later I found myself in the embarrassing situation to grind on my belly and legs over the snowy trail holding tight the sledge with my hands and trying desperately to bring my feet back on the runners. 100 meters further my pants and shoes were full of snow, my arms having carried my whole weigh seemed to be 1 meter longer and I had to be rescued. I finally let the sledge go falling in the soft snow right in front of Miss Sunshine, who laugh with special delight about my somehow unusual way to ride. I guess I made her day! Knowledge of the day: There is a time for everything, and a season for every activity under heaven: a time to be born and a time to die, a time to plant and a time to uproot, a time to kill and a time to heal, a time to tear down and a time to build, a time to weep and a time to laugh, a time to mourn and a time to dance, a time to scatter stones and a time to gather them, a time to embrace and a time to refrain, a time to search and a time to give up, a time to keep and a time to throw away, a time to tear and a time to mend, a time to be silent and a time to speak, a time to love and a time to hate, a time for war and a time for peace. [Eccl. 3:1-8] ....and a time to daydream, but maybe better not during work time.